This is Part 1 of a three part interview with Jamey. I thought I had posted the full trilogy a good while back but it seems I was mistaken. As such there are some very out-dated content included. BUT it is such a fantastic conversation that it is begging to see press. So I’m remedying the mistake. Here is the first of three. I hope you enjoy them as much as I did. I am extremely happy to have Jamey Stegmaier as my guest once again. Jamey is always a fun and interesting guest and this time was not exception. Except he stepped it up and flipped the tables on me. He started asking the questions. And it was really fun. It turned out to be the best interview so far. We talk about Stonemaier’s two newest games, Between Two Cities and Scythe. 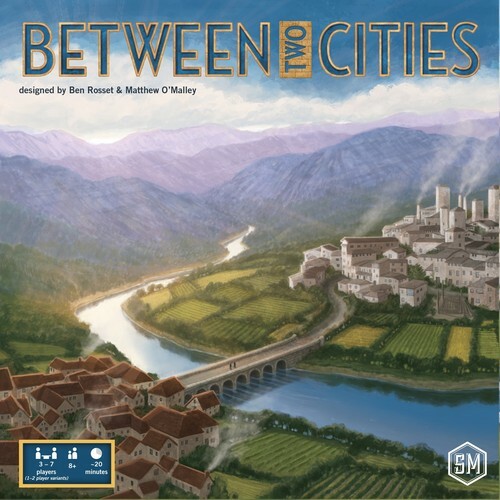 I have an interview in the queue with Jamey and the two designers of Between Two Cities. We talk a lot about Scythe and even more about the gaming community. It’s a sweet interview and I hope you enjoy it as much as I did. Tom: So Jamey, Stonemaier has two games in the works, Between Two Cities by Ben Rossett and Matthew O’Malley and Scythe based on the art of Jakub Rozalski. First tell us about Between Two Cities. What about this game grabbed you? Jamey: Hey Tom, it’s great to chat with you again. Thanks for asking about Between Two Cities, a game by Ben Rosset and Matthew O’Malley that I play ed for the first time at Gen Con. Two things stood out about the game: One, I loved the partnership mechanism (each player works with the player on their left to build a city and the player on their right to build another city). It gave me the feeling of camaraderie of a cooperative game, but the feeling of victory in a competitive game, as there’s only one winner. Two, I played a lot of demos at Gen Con, as did my friends/ambassadors, and even though we saw some very clever designs, Between Two Cities was by far the most fun. Tom: I’m working on one of those actually. Players are research professors at a university. They have to share their grad students, knowledge and experience with the other research labs to complete their projects. The more they collaborate, the more points they can earn. But collaborations come to an end at some point. Work in progress. I’ve heard of some co-petitive games but can’t think of them right now. Actually Cutthroat Caverns is one. You work together to get to kill the monsters fighting to get the killing blow but making sure you are the lone survivor at the end. And Legendary, the Marvel Deck Building Game is co-petitive. It’s pretty good too. Jamey: Awesome! I like the sound of that game–it’s that type of collaboration that devolves into competition that really interests. I haven’t played Cutthroat Caverns, but I’m familiar with the mechanisms, and that’s a good example. Can you tell me a little more about your game? What’s the most clever connection between theme and mechanisms that it currently has? Tom: It’s called University Labs and I’m trying to mimic what actually happens in a university setting. There’s knowledge sharing. In addition to your specialties, your lab has a pool of knowledge in grad students and post docs to help you complete your inventions. You know about nanotechnology and Dr. Bumpkin needs some help in that area. If you are willing to help him, he’ll score you some points when he completes his project. Dr. Smedly is a expert in optics and your current project requires some optics work. If he will accept your help on it, he’ll score a few points for his “Principal Investigator” (the player who owns him) when you complete that project. 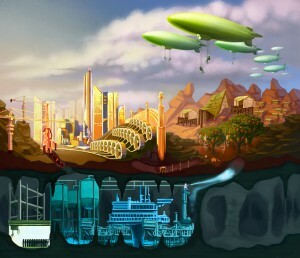 The game’s aesthetic is late ‘50’s / ‘60’s atomic age with the project / inventions like Robo-Nanny and Undersea Tunneling Machine. I’m hoping to be able to use actual art from the time. Mechanically, there some trick taking and hand management. It’s still young. Jamey: Very cool! It sounds like a really unique Euro game. Tom: I’m hoping so. Like you I saw Jakub’s art on Kotaku. I like it. It is fresh and unusual yet familiar. I am really impressed with it. 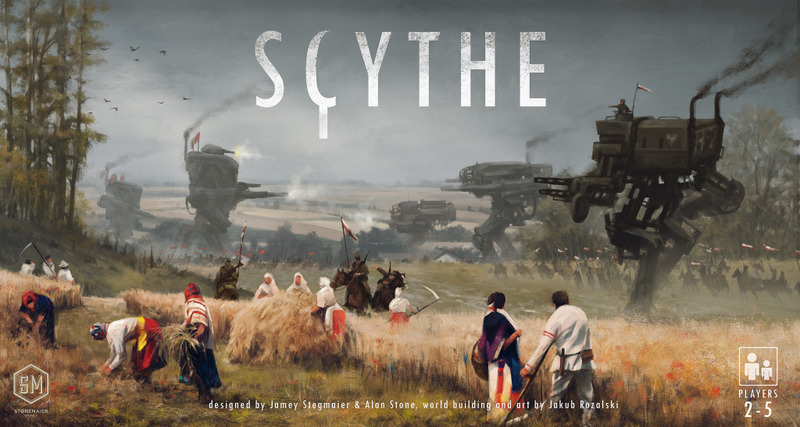 Scythe is the first game from this world. Talk some about it. How is the design process on this game different, if it is? Jamey: I’m glad you like it! I was entranced by it the first time I saw his work posted on Kotaku. 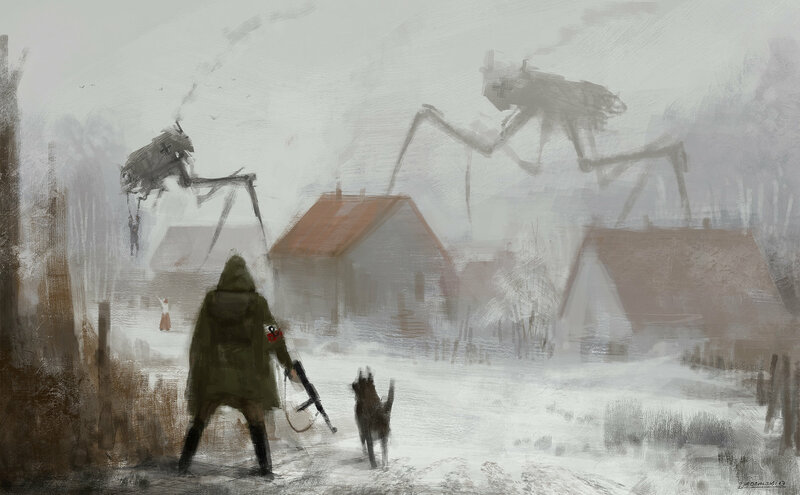 “Familiar” is the perfect word–even though you and I know that mechs didn’t stomp across Europe in the 1920s, Jakub’s depiction of them makes you think they might just have existed. I love the idea of alternate histories, as you can pull from the feelings and tropes of the real world, but you have the freedom to change anything you want as long as it still feels like it could have happened that way. The design process for this game is very different, because we’re working with a world that is just starting to come to life. Every few days Jakub sends me some new ideas and new art to help flesh out that world, and I then reply with how the world will impact the mechanisms. I mean that in a broad sense, as this is very much a game created around a world, not a world created around a hodgepodge of mechanisms. Like, the other day we were talking about the map, how a map of Europe is way too zoomed out to encapsulate the human element of the game. These are people you’re commanding, specific individuals, not generic tokens worth 10 or 20 troop units. So we were talking about how the map could accommodate that zoom level. I wrote that Scythe is “Agricola meets Kemet”. Have you played those two games? Does that pitch make you excited? Worried? What aspects of those games would you like to see mashed together, and which elements would you like to leave behind? Tom: Actually I’ve not played either of those. Yet. I’ve played Caverna which is supposed to be like Agricola. I liked it a lot. So I will assume that I will like Scythe. I will say that the alternate history aspect really grabs me. I like that sort of thing a lot. Keeping it familiar yet strange. Just out of kilter. That will be a challenge. I’m very intrigued as to how you will make the bits ‘specific individuals’, zoomed down. How that will work. Jamey: “Familiar yet strange” is what we’re aiming for. Jakub is currently working on how each of the factions will represent that idea–he has a great imagination, and paired with his artistic skills, it’s a killer combo. As for how we’ll make the specific characters, the closest comparison is Dead of Winter. You manage several characters, and they’re represented by cardboard standees on the board. The difference here is that you control a lot of characters, so the two key stats for each character will be on the cardboard standee, not just on their corresponding card. We’re going to have to find the right balance between too much information and too little. Some of your characters will likely go into “autopilot” mode–like, you’ll have a villager on a field, and every round he’ll produce 1 food automatically. He’ll still be unique in that you can activate him to do something special, but if you want to just focus on a few of your characters, it won’t be hard to do so. Tom: I’ve played Dead of Winter. I can see what you’re going for. It sounds really interesting. Characters with special powers is almost always a good thing. Jamey: Do you have any games in your collection where you control multiple characters? Sometimes games do it in subtle ways, like deckbuilding and handbuilding games where you have a lot of characters, but you only see 5 or so of them each turn to not overwhelm you with choices. Tom: DC Deckbuilding does that a bit. Sentinels of the Multiverse is a decent example of a co-op that does that. There are a couple more I’m sure. Wargames could be in the list if you count individual units as ‘characters’. Guildhall does this to some extent. Jamey, what games do you have or have played that do this? Jamey: Dead of Winter comes to mind, as does Tuscany’s special worker expansion. Libertalia gives you different characters to work with, though you typically only play each character once. You essentially control different characters in any worker-placement game, though they’re usually indistinguishable from one another. Tom: You are known as a Kickstarter guru. You’ve given and continue to give lots of good advice and experience about KS. What is the best advice you have received regarding Kickstarter? Jamey: The best advice I’ve received is to not compare my projects to other projects. I remember when Viticulture was originally on Kickstarter, at it was slowly working towards its funding goal when a game called Mars Needs Mechanics launched. It jumped to $10,000 raised in just over a day, and I felt myself comparing my project to it. It made me minimize my own hard work, and I started finding reasons to pick at the Mars campaign as part of my jealousy. But then someone (I think it was an entrepreneurial blog I was reading at the time) reminded me that nothing good comes from comparing yourself or your business to others. You can learn from others, but comparing the two is never healthy or productive. I’ve taken that to heart ever since. Jamey: What’s the best advice you’ve received about blogging? Tom: Find your niche. Mine is interviews particularly targeted to smaller publishers and designers. The other Tom (Vasel) will get the Bruno Cathalas and Martin Wallaces. I’ll do the Grant Rodieks, Danny Devines, and Phil Kilcreases. I want to shine a light on the lesser know guys. I do reviews also but am really slow because I want to play each game at least three times to get a true feel for it. That takes a lot of time. I have done some other content but interviews are what I enjoy the most. I’m hoping to jump to audio at some point. You are an avid blogger. Where do you get content? Where do you find time to actually write, edit, produce content? What advice would you give about blogging? Jamey: “Find your niche.” That’s awesome. If I can add to that, I would say that finding the niche is a journey. Don’t try to find it before you start blogging. You can attempt to write about certain topics, but give the blog room to breathe and develop over time. If you pigeonhole yourself, you may find over time that you’re not really as excited about that topic as you thought you’d be, and you’ll end up not writing. I try to write about things I’m excited about, and that method has sustained my personal blog for over 8 years. Tom: I started out Go Forth And Game on a suggestion from the Pulp Gamer guys. I used to write in comments to the podcast. Some of them were quite long so they said I should just start a blog to comment. It start out as that. A place for me to give feedback on podcasts. I stated to do reviews, ‘what I’m playing’, movie reviews, general geek stuff with a gaming bent. I found that I enjoyed talking to designers and finding out about new games and design things. So I totally agree with you on the evolving as you go idea. Jamey: I think it’s great that you focus on some of the less-famous people out there (who will hopefully be very famous someday!). And that’s neat that you hope to add audio someday. Tom: I am the voice for the unknown. I REALLY want to give the small guys (because I’m one of them) a place where they can talk about their games, design ideas, anything. And I keep saying ‘small guys’. By that I mean the publishers and designers that just haven’t hit it yet or only have one or two designs published. I want to focus on them. Not that I won’t have those who are successful and growing, like you, as guests too. By bring the part-time publisher, the hobby designer to the fore, I feel like I’m really contributing something to the community. Jamey: For me, it’s not so much about finding time, it’s about getting in a rhythm and sticking with it. I write on my personal blog 5 nights a week, and on my Kickstarter blog 2 days a week (down from 3 days, which was getting to be too much since I was also writing a Kickstarter book). Getting in that rhythm has really helped me produce content consistently. Well, that is Part 1. As I said this is a very long but really, really great interview. I don’t exactly know how I’m going to break this up, where the natural breaks are, but it is at least three parts. Jamey was very gracious, patient, and excited to talk to me again. He started asking me questions and it turned into a real conversation. I have to say – this is the best interview I’ve had. And I will model all subsequent ones after this. Readers, there’s more of this fantastic interview with Jamey on the way. Join me in a few days for Part 2.